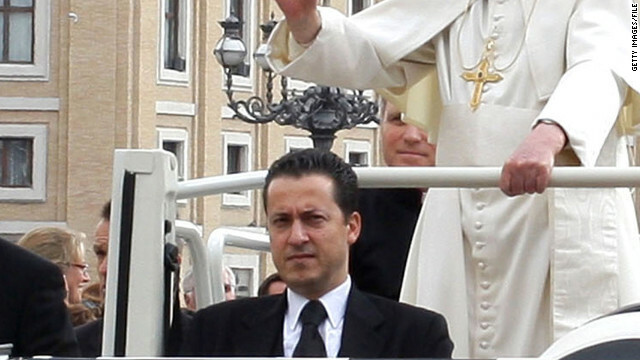 Pope Benedict XVI's personal butler Paolo Gabriele, known also as 'Paoletto,' ride through the Vatican in the popemobile. Rome (CNN) - Pope Benedict XVI's former butler declared himself innocent Tuesday of a charge of aggravated theft in connection with leaked documents - but said he had abused the pope's trust. Paolo Gabriele has previously admitted taking hundreds of secret papers from the pope's personal apartment and passing them to an Italian journalist. Anybody know how to read? Does the pope have time to call off the 'Record number of justices attend Red Mass' masses? It's not working. 'Sides, what up with being a commie? Killing babies follows those types. Just like those commie capitalists in China. The butler did it. They always do, ya know. It's written in their secret union by-laws. Why are the atheists on this blog so mean? Why are the Christians so mean? You are the ones threatening death and torture, and you've done it for a very long time. Give some examples of what you thought was mean. Be sure to include the post and reply (or multiple replies if the reply is simply to another reply). Why do you generalize about EVERY atheist? I find most atheists are not mean at all, in fact most simply want to offer their own insight into the debate. I find that a LOT of Christians find offense at Atheists who want nothing more than to have an open debate over the existence of a god, or not. Most Atheists aren't much different than most Christians. Of course not. I have known of plenty of nice atheists over the years. However, in my experience, there are a large number of atheists on this blog that seem to demean people who are religious. Why is this Christard so mean and h0mophobic? "pervert alert" or "...." – with one liners like "qu e ers the ones that brought aids to america"
disgruntled ex Evangelical Fortune Cookie Co. "writer"? Heh? Like that great blog post said, religion is for the ignorant, the gullible, the cowardly, and the stupid, and for those who would profit from them. Loosen up. I can't get my hand out of you. I'm sorry, "Atheism is not healthy for children and other living things", but your assertions regarding atheism and prayer are unfounded. The degree to which your assertions may represent truths is 0.0. To help you understand the degree to which your assertions may represent truths, I will access my Idiomatic Expression Equivalency module (IEE). Using my IEE module, the expression that best matches the degree to which your assertions may represent truths is: "TOTAL FAIL". Loosen up. I can't get my hand out. The statistical studies from the nineteenth century and the three CCU studies on prayer are quite consistent with the fact that humanity is wasting a huge amount of time on a procedure that simply doesn’t work. Nonetheless, faith in prayer is so pervasive and deeply rooted, you can be sure believers will continue to devise future studies in a desperate effort to confirm their beliefs!/. the butler probably got tired of turning a blind eye to all the little boys taken to the pope's chambers late at night for a "special vigil". He should have killed them all before taking the papers. vatican kept him sleep deprived... wow, talk about love and compassion. the pope is one evil mofo. Hello! Damned sharp sait. I never distinguish so well-heeled information.I security it wiil be more control superiors in future. And we strain to full this pages fresh stuff. Oh, stop acting as if you're not a paid blogger with no sense of the English Language! Calling BS on your asinine attempts!